FlexiTimer is easy to use, but there are some features, like gestures (shown in bold text) and groups, which require a little explanation. 1. Switch list into Edit mode where you can re-order and delete timers. 2. Access global app settings. 3. Edit the timer settings. 4. Tap to Start/Stop timer. Swipe Right to Reset timer. 5. 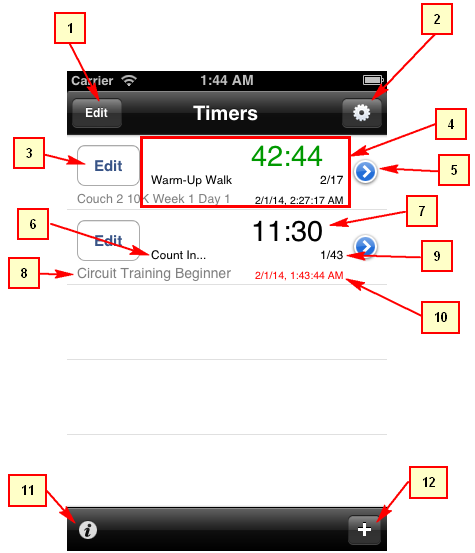 Switch to Run Timer view, which contains a large timer display and list of timer intervals. 7. Total Remaining Time for timer (ie. all remaining intervals). Black indicates timer is reset, Green indicates timer is running, and Light Grey indicates timer is stopped/paused. 10. Date and time when timer ended (shown in red) or will end (shown in black). Only shown when timer is running, or timer ended. 2. Save all changes to timer. This button is disabled if number of sets/iterations is zero, or there are no intervals (NOTE: a group does not count as an interval, as it is only a container for intervals). If adding a new timer, this will create a new timer at the top of the main timers list. 4. Number of sets/iterations. You can use this to easily repeat the timer multiple times. 5. Shows which sound will be played when the timer ends, and the number of times it is played. 7. Currently only has one sub-option which allows you to configure how FlexiTimer handles the multiple timer sets/iterations. When "Repeat Interval First" is disabled (default behaviour), all intervals will be run before repeating the timer. 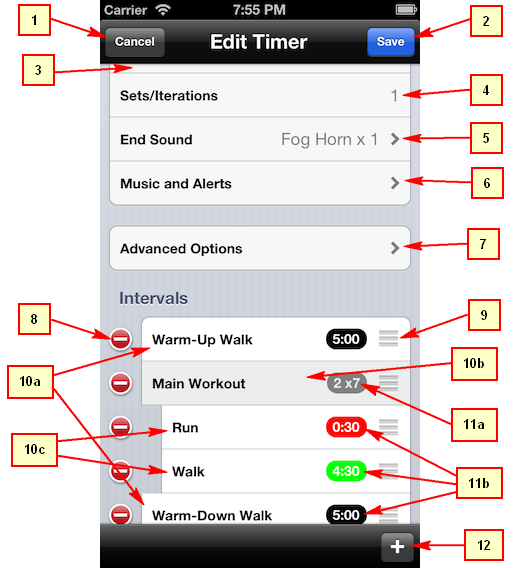 When it's Enabled, each interval will be run Timer Sets/Iterations times, before moving onto the next interval. For example, suppose you have 2 intervals (I1 and I2) and the number of Timer Sets is 2. When "Repeat Interval First" is disabled, it will run as I1, I2, I1, I2. When enabled, it will run as I1, I1, I2, I2. This gets more complicated/flexible as the number of sets/iterations can be set for both Groups and Intervals - Just remember that intervals repeat first, then groups, then timers. Further examples for this will be coming in the future. 8. Delete interval/group. NOTE: When deleting a group, all child intervals will also be deleted. 9. Re-order interval/group. NOTE: When re-ordering a group, all child intervals will also be moved with it. 10b. Group container, as indicated by light grey background. Allows you to group multiple intervals together and configure number of sets/iterations independently of other groups. NOTE: It's not currently possible to have groups within groups. Swipe Right on Group cell to add a new child interval to the end of the group. 10c. Child intervals are shifted to the right. They are exactly the same as normal intervals, but containined within a group. NOTE: It's easier to identify child intervals on iOS6, compared to iOS7, due to changes Apple made. We hope to improve this in a future version. 11a. Shows number of child intervals in the group (ie. 2 in this case) and the number of group sets/iterations (ie. 7). NOTE: the number of child intervals is not shown when there are none, and the number of sets/iterations is only shown when it is 2 or more. 11b. Shows the interval duration and number of interval sets/iterations. NOTE: As with groups, the number of sets/iterations is only shown when it is 2 or more. To edit an interval/group simply Tap on it. NOTE: You cannot change an interval into a group or a group into an interval, as this would allow a child interval to be changed into a group, resulting in a group within a group. This may change in the future, to allow the type to be changed, without allowing groups within groups. When adding an interval using the + button or the "Add New Interval/Group" cell, the type of the last interval/group in the list determines whether the new interval is a child interval or normal interval. If the last interval/group is a child interval or a group, the new interval will be a child interval at the end of that group. If the last interval is a normal interval, the new interval will be a normal interval. You can move a child interval out of a group two ways - 1. Swipe Left on the child interval cell, and it will become a normal interval just after the last child interval of the group. 2. Using the re-ordering control on the right of each cell, drag it above the parent Group cell or below a normal interval. You can move a normal interval into a group two ways - 1. Dragging it within the group (ie. after the group cell and before the last child of that group), or 2. Drag it to just after the last child interval and Swipe Right to make it the last child in the group. If the above seems complicated, it really isn't. Just try it out, remember the above rules and it will become second nature in no time.